I'm pretty sure that "started in the spring of 1969" qualifies this build for 'stalled' status. That would've been right around my fourth birthday. This one clearly deserves to be finished and given a place of pride on your shelf. I wasn't even thought of let alone conceived. Definately a stalled project. If you need some decals, PM me. I built one in '74; an accurate kit! HI Looks like it should be a fun build. Better late than never indeed. What paint scheme does this come with??? I saw a Walfisch with a brilliant fish scale paint job and thought that would be hard to do. HI Can't wait to see what you do th this one. I always wanted to build one but just never got around to it. 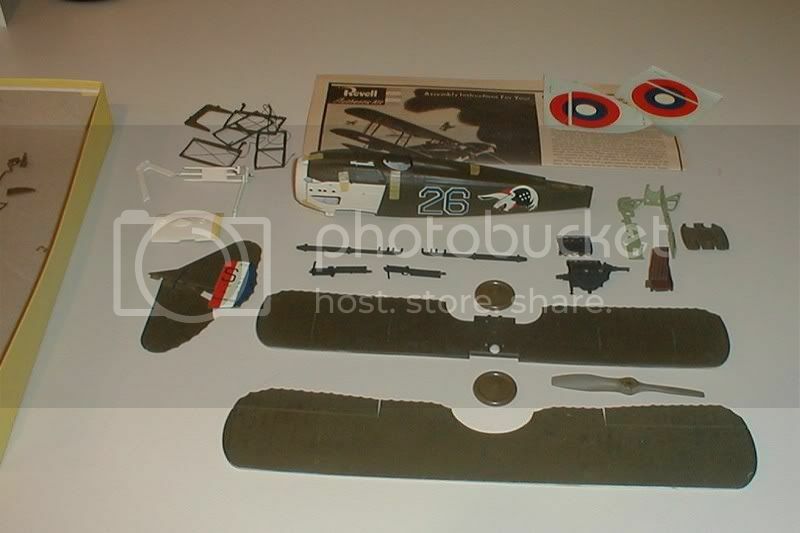 I slapped one of these SPAD's togeather as a kid when it was a new kit in 1958/59...at that time my favorite a/c models were the .79 cent Aurora WWI planes....when I get this one done (finally) it will be on of my oldest kits...my oldest could be the 1/64th B-25B issued by Revell in 1953/54. I don't recall how many of those i built and destroyed as a kid. I currently have four of them built in my collection. HI Yep those old kits from the fifties were a lot of fun to build and crash. I guess thats what got a lot of us hooked on modeling when we were kids and were still at it. It's sure is going to be neat to see you finish the Spad. I'd hate to see her all excited to finally be finished and then relegated back into the archives. Me too...I have been doing some work, I'm missing the control stick and have been doing some research on XIII cockpit and engine details, the Revell kit is quite simplified...I'm trying to resist the urge to add too much additional detail as my goal here is to complete this model somewhat like I may have done in 1969,, ...however, I won't be using sewing thread for the rigging... ...IMO the SPAD XIII is a cool looking a/c...this one is carring Lt.Frank Luke's markings and for us AEF history buffs makes it more meaningful..
HI Looks like you have your work cutout for you on this one but it should be a fun build. ggc, yes the 'pit is simple, but mostly accurate. I have some of these, and I figured to thin the wing attachment points, attach the struts to the bottom wing, and fill the gaps. The ends should be tapered also, after the big rigging loops are removed.